The new Restaurantes Vallarta Nayarit app joins the popular Vallarta Nayarit and Guest-Huésped apps to further enhance both domestic and international tourists’ vacations in Puerto Vallarta and the Riviera Nayarit. Tech plays a huge role in society in this 21st century of ours, and that obviously includes Tourism. This is why the Riviera Nayarit and Puerto Vallarta are eager to enhance their visitors’ experiences through apps for smartphones and tablets. The Vallarta Nayarit app is already in use, created by the Riviera Nayarit Convention and Visitors Bureau (CVB) and the Puerto Vallarta CVB as part of their joint campaign; as is the Guest-Huésped Rivera Nayarit app, created by the Riviera Nayarit CVB. A third app, Restaurantes Vallarta Nayarit, was recently created by the Puerto Vallarta National Chamber of Restaurants and Food Condiments Industry (Canirac, by its acronym in Spanish). “We’re trying out different strategies in order to develop the sector, because one of the top things our restaurant owners ask for is exposure. We have a fabulous gastronomic variety and we must continue to look for strategic ways to promote it,” said Ana María Lomelí, General Manager of Canirac Puerto Vallarta. Today nearly everyone has access to an Internet-ready mobile device or has Wi-Fi available at the click of a button. That’s why it’s so important to move into this territory and take advantage of the benefits technology can offer. The objective is to bolster the promotion of the region’s gastronomy and the different attractions within Puerto Vallarta and the Riviera Nayarit. Besides promoting the restaurants in both destinations, the Restaurantes Vallarta Nayarit app also offers space for other types of businesses; it serves as a tour guide and links to the official websites for both destinations. Among its services, the Vallarta Nayarit app allows users to call to or from Mexico to the United States or Canada, their main markets. 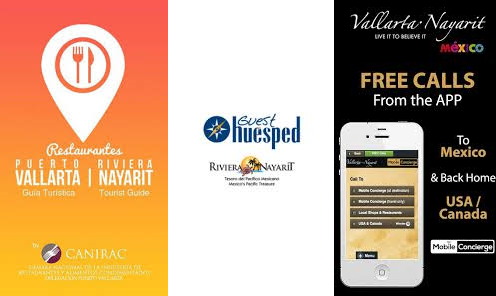 The Guest-Huésped Riviera Nayarit app is wholly an interactive guide. To learn more about these apps—compatible with Android and iOS systems—simply download them and start enjoying their many benefits.